Tama: Good morning everyone. We have some guests trawling the halls today. Now go to work. And please enjoy yourself! Encompassing a lot of my thoughts for how awesome The Raid was can be simply brought down to saying that during my viewing of the film, following yet another incredibly well filmed, well choreographed action sequence, my friend announced that he was sweating. It was humorous, but appropriate, as the film is so exhausting, yet riveting to watch; so intense, yet satisfying to see the action taking place; and so simplistic in setup, yet so rewarding in regards to seeing filmmakers deliver an enjoyable film, that taking a second to make a statement about one’s awareness is really the only way to keep one from getting too involved and ending up hitting someone yourself. Ok, so maybe the film isn’t crazy and immersive enough to make someone do something that stupid, but The Raid is easily one of the finest action films to grace screens in quite some time. Describing the plot of the film really won’t take too long, as it is quite simple. In a slum neighborhood of an unnamed city (The Raid is Indonesian) exists a near impenetrable apartment building, which has become home to a nasty drug lord, who resides on the 15th floor. An elite SWAT team is tasked with raiding the building, in an effort to capture this man. Despite attempts to be as covert as possible, a chance encounter with a spotter blows their cover and news of their assault reaches the drug lord. The unit must fight their way through a near unending supply of vicious criminals and killers in order to survive their mission. Within all this exists a rookie member of the SWAT team, Rama (Iko Uwais), who has his own reasons for being on this mission as well as the skills he needs to take down a lot of bad guys. Of course, with all the exits being sealed and 15 floors worth of deadliness all around, Rama is going to have to work extra hard if he wants to make it home in one piece. There is very little setup in this film, before the action kicks into gear, and once it does, it hardly lets up. The Raid clocks in at about 100 minutes and about 85 of those minutes are action oriented. This film is incredibly economical, to say the least, when it comes to delving into the depths of the story that takes place, but that is not at all what one should focus on. This is a film that is designed to be a thrill ride of the highest caliber in the ways that it delivers a full on action experience, which ranges from having martial arts fights, fights with knives, machetes, gun battles, straight-up brawls against multiple foes, and other sorts of violent, improvised craziness (refrigerator bombs). The fact that the film does devote a little bit of time to some sort of story is frankly a bit of a way to create moments to catch one’s breath while watching the film. Director Gareth Evans is a Welsh writer/director, who has based himself in Indonesia in order to create the films he wants to on a small scale budget. For The Raid, he has managed to make a pretty incredibly looking film all for the price of around $1 million. One thing is certainly clear; Evans has a deep admiration for traditional martial arts films, among other classic action genres. The way he has made this film gets a huge amount of enthusiasm from me, due to the fact that all of his action sequences are clearly defined, despite taking place amidst chaos, featuring numerous participants, and moving at lightening fast speeds, as we see plenty of attackers performing multiple moves, many during a lot of single takes, before cutting to the next shot. The fight choreography is spectacular here and the cinematography and other factors that went into capturing these action scenes do an outstanding job at showing it. Given how brutal and ugly some of the violence is, there is true beauty in the carnage displayed. I have recently been called into question regarding my thoughts on the Navy Seals film Act of Valor, given that I pointed out how the acting and story are essentially nonexistent, despite having plenty of technically detailed (and fairly accurate) action sequences. One could point out that I may be being slightly hypocritical in praising a film like The Raid for being very much the same type of experience, given the equal lack in deep storytelling and characters; however I do find there to be a difference. In both films I acknowledge that deeper meaning and character are not things I went to see, but The Raid gets much higher regard due to the fact that I was way more invigorated by what was taking place on screen. Act of Valor had its fun moments, yes, but I also found some of the action filmmaking to be a bit clunky when it came time to spot clear direction or even separate who was who. The Raid has no problem with this. The filmmaking is fantastic, clear, and has no additional baggage of being a former recruitment video or trying to stay rooted in realism. The Raid is a film that wants to be as entertaining as possible and does so by keeping itself rooted in a frenzy of riveting suspense and action sequences that are edited to be as effective as possible (and to be fair, the performers were more effective here as well). 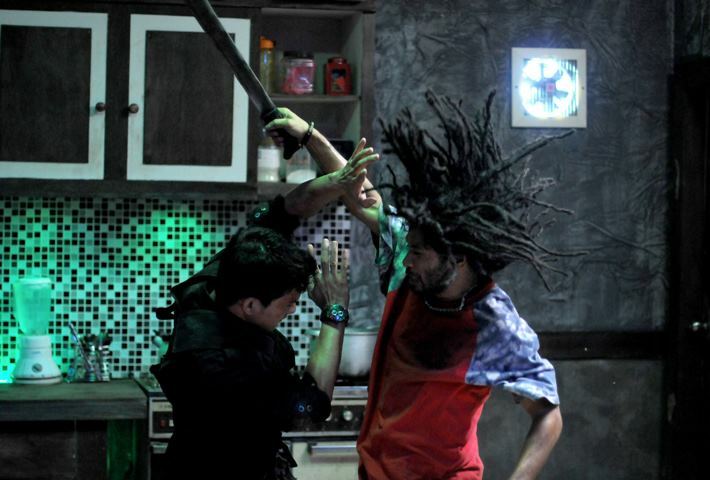 Regarding the style of this film, The Raid can be easily described as a hybrid of the kinds of films John Carpenter and John Woo have made, with a heavy dose of elbow and knee poundings from Muay Thai superstar Tony Jaa. The simplistic storyline with extended sequences of pure fantastic, creative, and brutal action beats work very well together. And again, the notion of old fashioned martial arts films is quite apparent here as well, given some of the fights (and especially one fighter), which are staged to be focused on hand-to-hand fighting with an added sense of whatever these people consider as honor, given the desire to not use guns if they are not needed. Of course, this being quite the cynical film, the real bad guys don’t have any sense of honor and seeing their terrible actions take place as they go against the “good guys” of the film is just as exciting, simply because the results and takedowns in this film generate so much bloody joy. Given the nature of the story and setting, this is of course a film with plenty of grit. 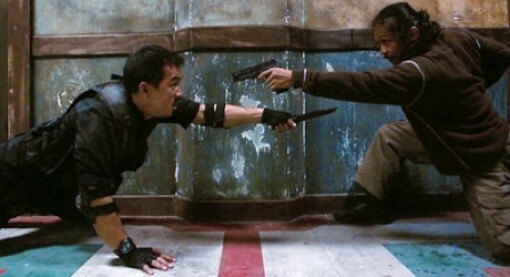 Set decoration was probably not something that needed to much thought, were this to be filmed on a specific location, but were it to have been done on a set, Evans certainly nailed his vision of ugly corridors being torn up by thugs and SWAT units fighting and blasting away at one another. Given the hyper reality that this film exists in, it seems apparent that the mix of the various filmmakers I have referred to and the nature of old school side-scroller fighter video games (Final Fight, Streets of Rage) complement each other well in the case of The Raid. The score added to this U.S. release of the film by Linkin Park’s Mike Shinoda and composer Joseph Trapanese only helps things further by supplying a series of beats that function just as much as scoring for the scenes as they do as sound effects to further punctuate the moments that matter. I would be surprised to see any mainstream studio film this year tackle action sequences with as much well-choreographed fluidity and crazy, visceral, bloody violence as The Raid (even Dark Knight Rises will still be contained in a PG-13 world). 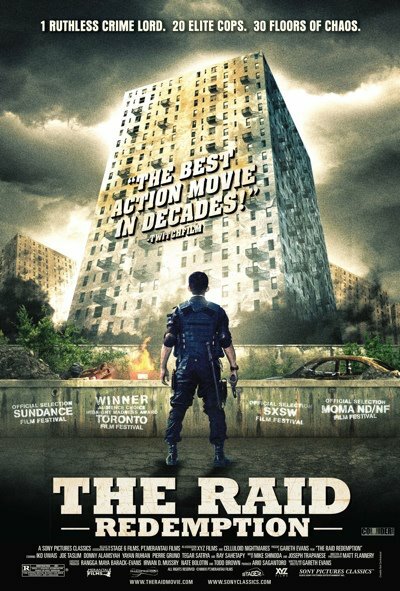 The Raid is a blast to watch and it benefits well from its rapid pacing being applied to nearly every aspect of the film. Setup takes almost no time. The action sequences move with amazing speed, while maintaining clarity. The sense of immediacy seen in the elaborate nature of these sequences is very apparent. And the sense of editing matches the riveting nature of this film as a whole. While certainly brutal and offering few characters to sympathize with, The Raid is still a blast to enjoy and is well worth it for anyone that wants to check out an awesome and insane action flick. Mad Dog: Squeezing the trigger is like ordering takeout.